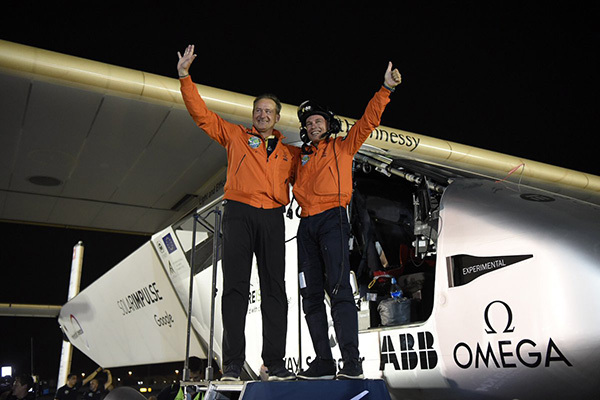 (P1) Only one year after it first took flight, a solar-powered plane has completed an epic around-the-world trip without burning a single drop of fuel. (P2) The revolutionary zero-fuel aircraft, Solar Impulse 2, is piloted by Swiss engineer and businessman André Borschberg and Swiss psychiatrist and aeronaut Bertrand Piccard. The two have been developing the plane for over a decade to promote clean technologies. (P3) The Solar Impulse 2 touched down Tuesday morning in Abu Dhabi, at the same airport where it embarked back in March 2015. (P4) Over the last 16 months, Piccard and Borschberg took turns flying the aircraft nearly 27,000 miles, tallying eight world records along the way. Would you fly in a solar-powered plane? Why or why not? Should solar-powered energy be used more? Why or why not? What are some other renewable energy sources? How long did it take the plane to fly around the world? What kind of fuel does the plane run on? How many people flew the plane? What source powers the plane?